can tiny pieces of glass in my feet cause me diabetic problems. I am a diabetic and I accidently stepped on some broken xmas tree bulbs. I don`t know how long I was walking around pieces of glass in my foot since I do have numbness in my feet.the glass was so small in pieces I`m afraid I didn`t get it all out. can that cause me problem? Unfortunately, your problem may be an accident waiting to happen. Anyone with glass in their foot should make an effort to have it removed and this becomes even more necessary in a diabetic. I have no idea how "bad" a diabetic you are as you do not mention your medical history, but assuming you are not a controlled diabetic then the problem becomes even more menacing. A diabetic should constantly monitor their feet in an effort to keep them as healthy as possible. The reason for this is because an infection in a diabetic can have far greater consequences than in the non-diabetic. If you have been diabetic for some time, or are under the care of a doctor for your diabetes hopefully you are aware of the potential problems of foot infections. The reason for this is quite straightforward. Over time most diabetics, particularly those that are poorly controlled will begin to lose sensation to their feet, known as diabetic neuropathy. Accordingly, you apparently are already suffering from this. Secondly many diabetic will also experience a loss of blood flow into their feet as diabetes causes blockages in small and medium sized blood vessels. 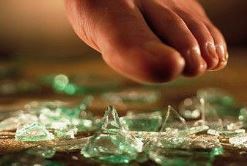 So in a typical scenario a diabetic may step on something like broken glass (you) and in many cases not even notice it because they have limited feeling on the bottom of their feet. open wound, however small, on the bottom of their feet. This opening then becomes the focal point for a potential infection if the area gets dirty and lets face it, feet are always exposed to dirt. If an infection does develop in most people blood will flow to the area to try and heal the infection. If an antibiotic is required, blood will also bring that to the wound in an effort to kill the bacteria. If there is not enough blood flow, then nutrients and antibiotics cannot get to the wound and the wound will naturally worsen. Additionally, if your blood sugars are not adequately controlled (and again, I have no idea if yours are or not) this will make matters worse. This is because bacteria seem to grow better and faster in what is known as a "sweet environment" which is what happens when your blood sugars are not under control. As you can see you have potentially created the perfect storm for a foot infection. I will tell you this; most diabetics that I have seen over the years who have gone on to lose a toe, part of a foot, or even a leg, in most cases have started out with simple problems that could have been avoided. The smart money would be for you to see a doctor immediately, even if your blood sugars are controlled and your circulation is adequate, and have the remaining glass removed. I would suggest you see a podiatrist in your area as it seems we have had the most practice in removing foreign bodies from feet and hopefully along with removing the remaining glass the doctor will give you instructions on the proper care of a diabetic foot.